Sometimes a secret is all you have left. Detective Ngaire Blakes is back on the case when a skeletonized murder victim is discovered thirty-six years after his death. While a fierce and glorious fire lights up the Port Hills of Christchurch, Ngaire fights to piece together a crime that took place during the Springbok Tours of 1981. A period that pitted father against son, town against city, and showed the police using batons to beat back protesters on the evening news, night after night. This is the third – and hopefully not last – in the fabulous Detective Ngaire Blakes series. And, as with The Three Deaths of Magdalene Lynton, Blakes is on a cold case. A skeleton is discovered by an idiot looting houses that have been evacuated due to the hills of Christchurch being ablaze. The skeleton is in a shallow grave, and from a protest badge close to the remains, appears to date from the time of the 1981 Springbok Tour. An autopsy finds evidence that the young man was killed by a Police baton. Added to this, when the deceased is identified it looks like the investigation into his death was virtually non-existent. So, was this a cover up of Police brutality? As Blakes investigates, she discovers divisions between families, the racism that is still alive and well in our society, and the sad and complex lives of those whose lives don’t fit “the norm”, like the victim: “A prince of oddities in a community where being the same is a commodity”. Sam, the victim, had a girlfriend, Shannon, who has served 15 years for brutally killing two teenaged boys. Shannon’s father is wracked with guilt over something. Down in Dunedin a Christian counsellor is helping men stay true to the lifestyle God intended for them. How does this all fit together? Wonderfully. 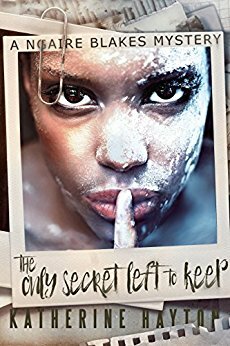 The Only Secret Left to Keep is a cleverly plotted and sad satisfying mystery, one you have to think your way through to put all the pieces together. And the unravelling reveals more of Blakes, her traumatic history, and her determination to face her demons. You could read this as a standalone, but I am glad I read the series from the beginning.